Medirota is used to effectively plan, operate and report on mixed-role activity for consultant-led services in a wide range of clinical, surgical, medical and ward based departments. Medirota is used to coordinate around 4,000 staff in 98 departments at 38 NHS Trusts. Medirota helps departments present a clear overview of the service that is planned and then delivered. Data and reports are readily available and provide information that allows departments to shape and model their service. Mapping allows for rota information to be shared between departments to improve communication and collaboration within and across teams. Medirota helps departments plan for future activity based on job plans and service demands. Medirota allows quick and accurate changes to be made to live rotas, helping departments meet changes in demand and capacity. 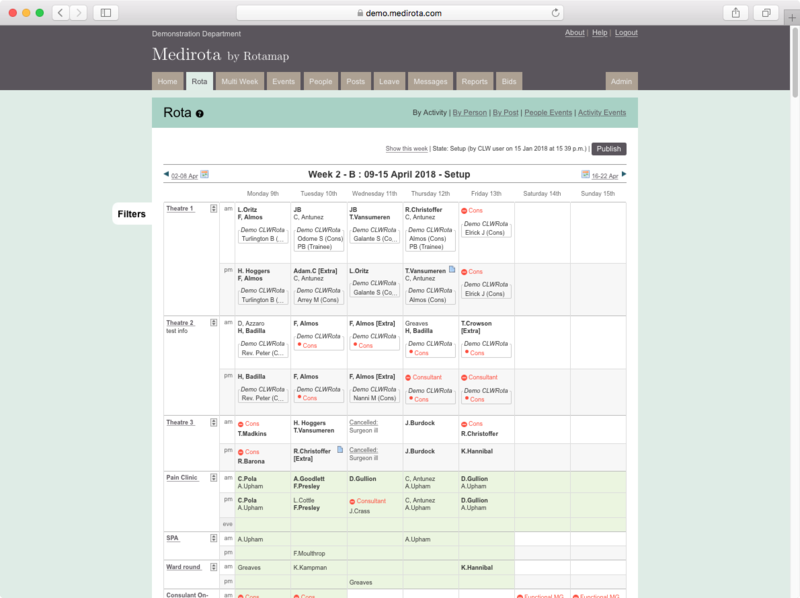 Medirota provides easily accessible data on departmental performance, including the number of planned sessions, the actual number of sessions worked, and detailed leave reports. 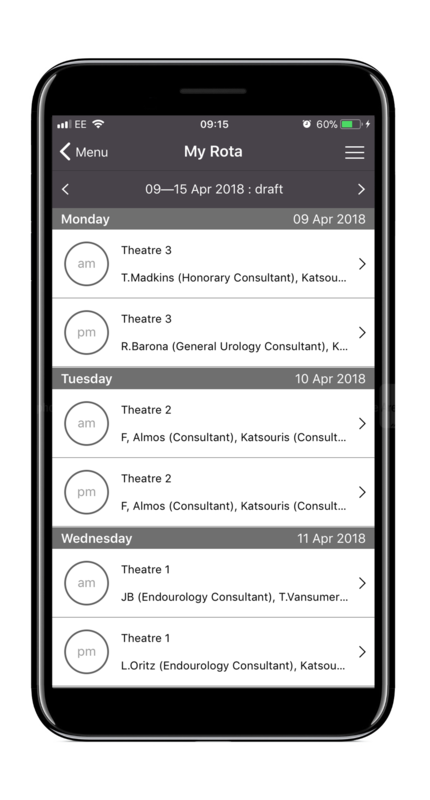 Our mobile app puts one up-to-date rota in everyone's pockets. 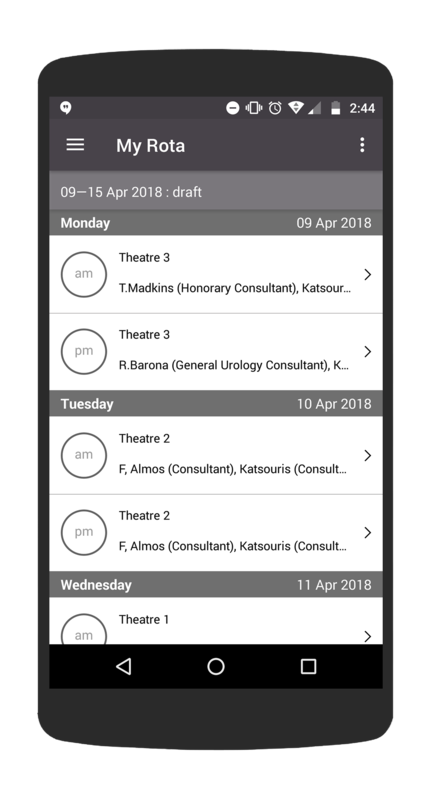 Clinicians can request leave via the mobile app, and "bid" to work uncovered sessions that are offered out by the rota team. 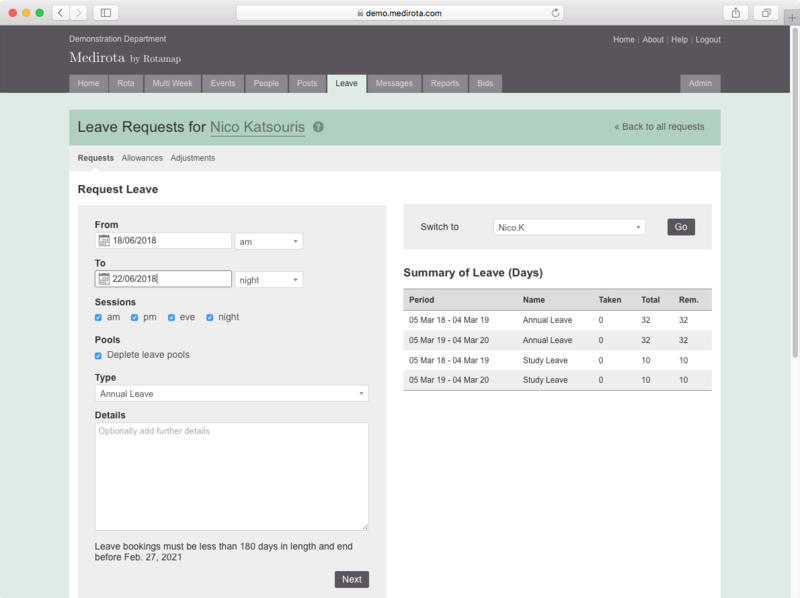 The leave system allows users to request leave, which enters a queue for the rota master to approve or reject. In addition to this, departments can choose to allow automatic approval for requests that meet a set of pre determined rules. 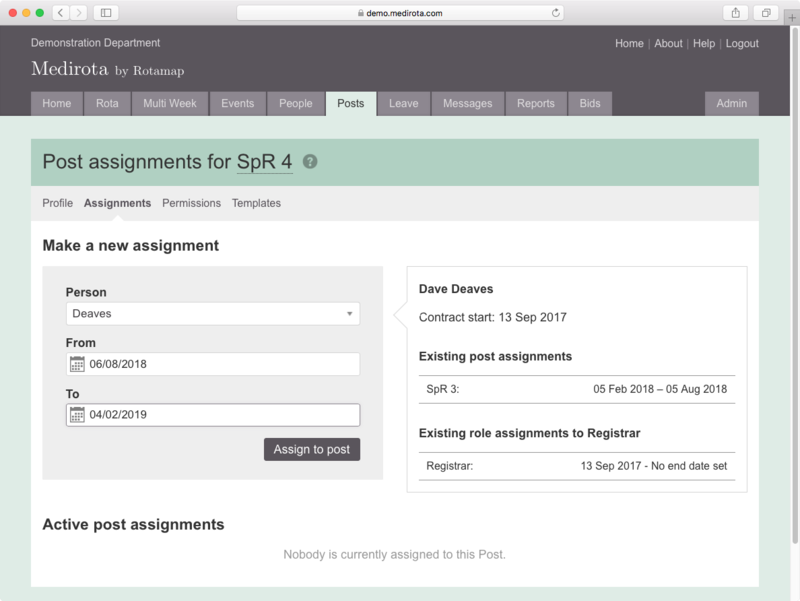 Posts is a tool for managing rotations of work that can be easily transferred between different members of staff. People can be assigned to a post for a set period of time, making handovers to new staff straightforward. 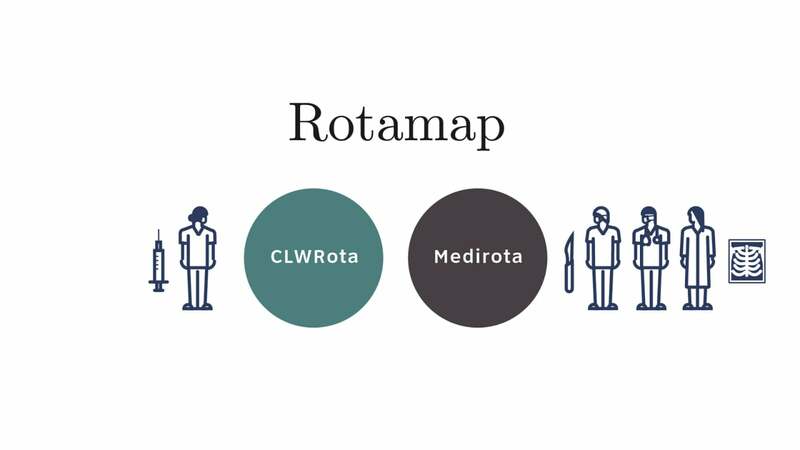 The mapping feature on Medirota allows users to see who they are working with from other specialties if they are using CLWRota. Surgery-wide Doctor Rostering (SDR) combines CLWRota and Medirota services for doctors in all surgery-related specialities. Surgery-wide Doctor Rostering enhances communication and collaboration between departments and provides metrics to guide improvement in areas such as consultant productivity and theatre utilisation. Trustwide Doctor Rostering (TDR) has been adopted by several of the largest Trusts in the country including 3 from the Shelford Group. It combines CLWRota and Medirota services for all doctors across an NHS Trust. TDR enhances communication and collaboration between departments and provides metrics to guide improvement in areas such as consultant productivity and theatre utilisation. "Using Medirota has allowed us to demonstrate some of the inefficiencies that were ingrained in our department, allowing our admin team to plan further in advance and subsequently make more efficient use of substantive resource." "Medirota has helped us remove the duplication of effort and associated waste when constructing the rota and most crucially, provides a central document for all staff who need it. It has solved the issue of double booking clinics and theatre lists and provides the opportunity to audit of our session provision with minimal effort. The number of queries regarding the location of our staff has dramatically reduced and Medirota helps us communicate vital information about the rota throughout the Trust." "Having the ability to view several weeks of rota in advance, highlights shortfalls in staff levels ahead of notice, allowing for better service planning and reducing the element of last minute panic changes."